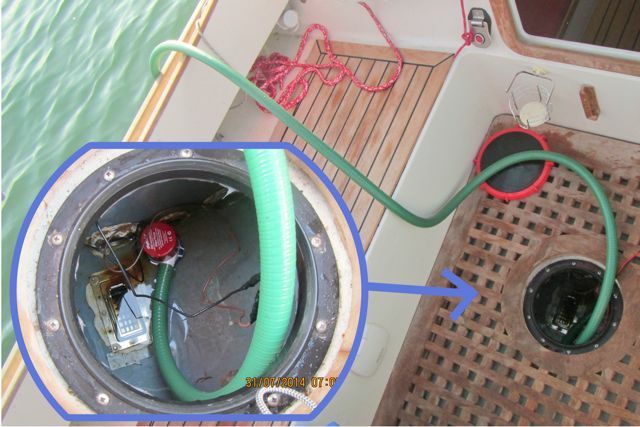 Choice of equipment, installation and use: The Whale Gulper 320 pump was chosen and installed by Swallow Boats in the cockpit locker. At around 15 litres/minute specification, emptying the tanks should take around 26 minutes but actually seems to take around 30 to 45 minutes – the manual pump is much faster and quieter! However the electric pump is self priming, can run dry without damage, and offers ignition protection to ISO8846. The latter is important if petrol is kept in the same locker. I wish it was quieter and faster but maybe it’s the best for the task. I installed a dedicated 2 core cable from the fuse board to the pump. One tank emptying will take about 4 to 6 Ah which could be significant. Note from 2014 (now superseded by use of Johnson Ballast pump): Recently I obtained a submersible 12V bilge pump (Rule model 20R) and tried using that instead of the Whale. What I discovered was that the limiting factor is the small bore pipe connecting the forward and aft tanks. The bilge pump quickly emptied the aft tank but then I had to switch it off and wait for water to flow from the forward tank. By the time I’d repeated this process a couple of times it had taken as long as it takes with the Whale. Since the latter can be just left on until the tanks are empty, it’s easier than using the bilge pump. I suspect that is why Matt has chosen the Whale. However with the Whale the emptying tanks contain significant amounts of water for longer (which is not good for stability) and it’s using power all the time. I much prefer the 12v bilge pump which I simply lower through the cockpit hatch with a pipe going into the outboard well or over the side. I am wondering about installing it instead of the Whale. Probably the best would be to install an automatic ballast pump in the aft tank with a switched power supply to it. The pipe could go up the present pipe for the Whale – assuming I removed the Whale and joined the pipes going to it. N.B. : The opinions expressed are my own after a relatively short period of use; there may be ways around any problems identified. Other users will have different priorities!